FANBOY PLANET.com . 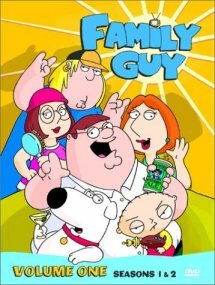 : mc-familyguynews :. All Hail The Zombie King of Cartoon Sitcoms! This show will not die. Over at IGN.com, Family Guy creator Seth McFarlane confirms that he will be going back into production on new episodes starting in April. Thus does this oft-cancelled series, which has been dormant since 2002, get a fourth season. Though a Fox executive commented they were hoping to get new episodes on the air by January 2005, McFarlane would not confirm that the network would actually get the fourth season, saying that Cartoon Network still had to be considered in the mix. It is, after all, Cartoon Network's adding Family Guy to its Adult Swim block that is partially responsible for Fox's interest in the first place. The series has been extremely popular on Adult Swim, and combined with last year's DVD release being one of the top-selling TV shows of all time, Fox had to figure they had done something wrong by canceling it in the first, second and third places. McFarlane has several leftover scripts that he plans to fold into the fourth series. As well, he hopes to reunite the original cast - not as hard as it sounds, since he himself did many of the voices.